This circuit is for a “F.R.E.D.” that is designed to be used with DCC control systems. The circuit is based on the LM555 timer chip. Two versions of the circuit are shown. The first uses a full wave supply while the second uses a half wave supply. Both should work equally well. The flash rate and duration can be adjusted by changing the values of the resistors R1 and R2 in the timing portion of the circuit. 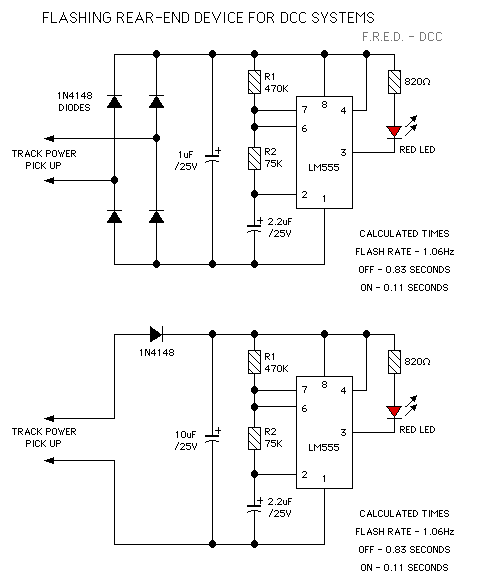 Increasing the value of resistor R1 will slow the rate at which the LED flashes. Increasing the value of resistor R2 will lengthen the time that the LED is ON.